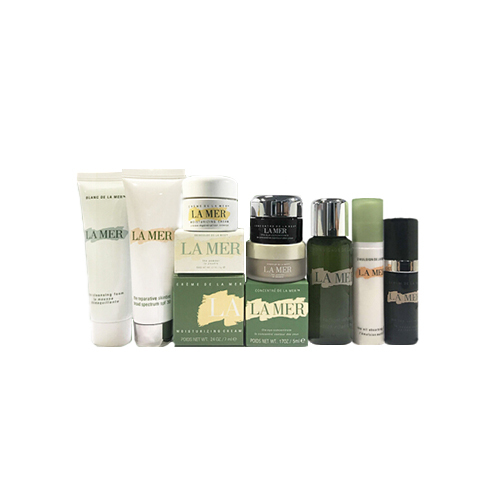 La Mer Moisturizing Cream 7ml This luxuriously rich cream deeply soothes, moisturizes and heals away dryness. Skin looks naturally vibrant, restored to its healthiest center. Miracle Broth™ – the legendary renewing elixir that flows through all of La Mer – infuses skin with sea-sourced renewing energies. Ideal for drier skin. La Mer The Powder 3g A light-as-air, luxe-to-the-touch, translucent powder that magnetically attracts to skin for a flawless finish. Formulated with airspun seaborne particles, some of the lightest materials on earth, this luxurious powder appears to float over the skin for an imperceptible finish. Visibly perfected, skin is infused with Miracle Broth—the healing force that flows through all of La Mer. La Mer The Eye Balm Intense 5 ml A soothing, fast-penetrating eye balm that smooths, visibly reduces puffiness, and instantly de-stresses for the ultimate well-rested look. La Mer The Blanc De La Mer Infusion 30ml An intensive brightening face treatment Features a lightweight gel-fluid texture that penetrates rapidly into skin Contains MicroWhite Ferment to reduce the appearance of dark spots & discoloration Blended with nutrient-rich Miracle BrothTM to nurture, soothe & transform skin Delivers superior moisture to soothe sensitive skin Unveils a smoother, clearer, brighter, more even-toned & younger looking complexion. La Mer The Moisturising Lotion 10ml This fast-absorbing lotion delivers renewing moisture for a balanced glow. Skin looks naturally vibrant, restored to its healthiest center. Miracle Broth™ – the legendary healing elixir that flows through all of La Mer – infuses skin with sea-sourced renewing energies. Ideal for combination skin. La Mer The Whitening Essence Intense 5ml Powerfully radiant Gives the feeling radiant and help cope with aging VibraWhite Ferment TM Blend ingredients from the fermentation of all three varieties. Help move the skin’s surface. Marks and uneven skin tone. Miracle Broth TM with water extract key importance in helping to restore skin’s La Mer. Hydrates Soften And helps restore skin’s natural processes. Keeps the skin smooth and radiant compact and tighten the pores and then fade. La Mer The Cleansing Foam 30 ml This gentle cleansing foam purifies delicate skin. Drawing out impurities and excess oil, this light wash leaves skin feeling soft and energized for a bright, fresh, healthy-looking complexion. La Mer The Reparative Skintint Broad Spectrum SPF 30 30 ml These light-as-air tints perfect the complexion instantly. Pores appear refined, and skin looks healthier each day. Miracle Broth—the healing force that flows through all of La Mer—energizes and helps skin focus on repair. The Perfecting Ferment visibly softens lines and wrinkles. The supercharged seaborn Translucensea Ferment helps fight discoloration and gently clears away surface dullness. SPF 30 and Lime Tea Concentrate, a proprietary antioxidant powerhouse, help protect against stress, environmental aggressors and pollution that can age the look of the skin. 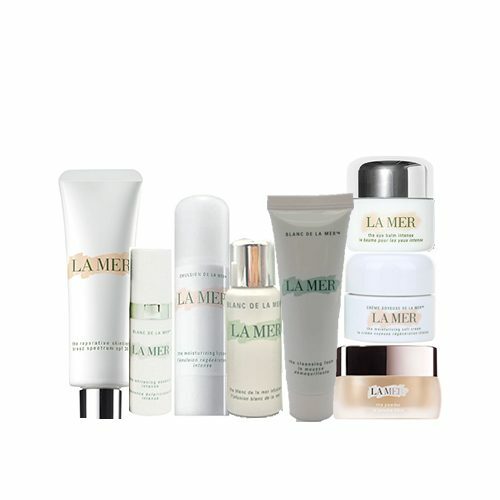 La Mer The Moisturising Soft Cream This ultra-soft cream deeply replenishes for a beautifully glowing radiance. Skin looks naturally vibrant, restored to its healthiest center. Miracle Broth™ – the legendary healing elixir that flows through all of La Mer – infuses skin with sea-sourced renewing energies. Ideal for combination / drier skin. Pat a small amount between fingertips to release the Miracle Broth™ and press gently into cleansed skin, morning and night. La Mer Cleansing Gel This gently foaming gel cleanser draws out impurities, excess oil and pollutants with a refreshingly light touch. Daily debris is removed to help the complexion maintain its delicate balance, then rinses right off. Skin looks energized, fresh and vibrant. La Mer Treatment Lotion This super hydrator optimizes the rest of your La Mer regimen. Like “liquid energy”, this fast-absorbing treatment delivers an instant rush of hydration to visibly soften, nourish, improve texture and even tone. After cleansing, sprinkle a small amount onto fingertips or saturate a cotton pad. Press into skin. Follow with your La Mer serum and moisturizer. La Mer Concentrate Infused with a mega dose of cell-renewing Miracle Broth™, this treatment promotes skin’s natural healing process by soothing visible irritation and reducing the look of redness. Skin feels more like itself – flexible, resilient, soft and supple – with a look of health and vitality. Thoroughly massage onto skin at least twice daily or as needed. Follow with your La Mer moisturizer. La Mer Eye Concentrate This concentrated eye cream reveals a luminous vitality where the impact matters most. The deeply emollient treatment hydrates and softens the look of lines for a smooth, healthy appearance. This formula helps visibly diminish dark circles for a luminous new life. Twice daily, dab a small amount onto applicator and gently massage onto eye area for increased microcirculation. The secret to activating the Miracle Broth™ in Crème de la Mer lies in a soothing ritual. Warm it for a few seconds between the fingers until it becomes translucent, then press gently into the skin. Dab a small amount onto applicator and gently sweep onto eye area morning and evening. For optimal results, follow with the Lifting Eye Serum and your La Mer moisturizer. Smooth over face and neck with fingertips. After preparing skin with dyslexia in fusion pump products on the fingers and press the tap to the face and neck. For maximum efficiency Should be followed by Moyse riser for your skin. Gently massage in circular motions to form a rich foam. Smooth over skin after applying moisturizer. Rinse thoroughly. Avoid eye area. Follow with your La Mer serum and moisturizer. Thoroughly massage onto skin at least twice daily or as needed. Follow with your La Mer moisturizer. Twice daily, dab a small amount onto applicator and gently massage onto eye area for increased microcirculation.